A powerful M9-class solar flare erupted from the sun at 10:09 p.m. EDT on July 29 (0209 GMT July 30). A powerful flare erupted from the sun this past weekend, but while the storm was not aimed directly at Earth, it was nearly the most powerful type of solar storm there is, scientists say. The brief but strong solar flare occurred late Friday (July 29) at 10:09 p.m. EDT (0209 GMT July 30), and grew in intensity. The flare was followed by an unrelated geomagnetic storm, which was triggered by fluctuations in the solar wind, according to Spaceweather.com, a website that monitors space weather events. As a result of the solar storm, skywatchers at high latitudes, particularly in the southern hemisphere, were alerted for potentially dazzling aurora displays. The M9-class flare erupted from a large sunspot, officially known as AR 1261. 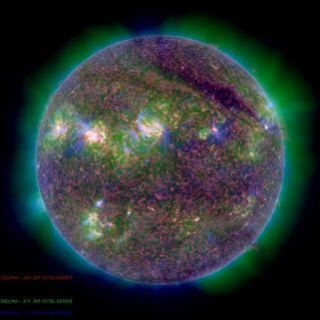 Two large sunspot groups have emerged on the sun, reported Spaceweather.com, and the active regions are breeding grounds for weak to powerful solar flares. "Because of its brevity, the eruption did not hurl a substantial cloud of material toward Earth," Spaceweather.com reported. "So far none of the eruptions has been squarely Earth directed, but that could change in the days ahead as solar rotation turns the sunspots to face our planet." Scientists use a three-class system to measure the strength and intensity of solar flares. The most powerful storms are Class X, with Class M solar storms being medium strength but still powerful, according to NASA. The weakest types of solar flares are Class C storms. Strong Class X flares can bathe the Earth in high doses of ultraviolet radiation and X-rays, hurling huge bursts of solar wind in our direction. When these bursts arrive at our planet, the electrons and protons from the solar wind come into contact with Earth's magnetic field, and stream toward the magnetic poles. These types of disturbances can create geomagnetic storms in Earth's magnetic field. Earlier this year, on Feb. 14, a monster Class X2.2 solar flare erupted on the sun, hurling a massive wave of charged particles into space and toward Earth. This flare was the strongest one seen in four years.